We are investigating how tumours survive in conditions which include low oxygen (hypoxia). Our goal is to target the hypoxic parts of tumours to improve cancer therapy. In order to progress beyond a certain size, tumours need to develop their own blood supply for nutrients and oxygen. Figure 1: Hypoxic regions occur in most of not all solid tumours. (A) HCT116 cells (human, colorectal) were grown as a tumour xenograft to an approximate diameter of 8 mm. Prior to sacrifice animals were injected with 60 mg/kg pimonidazole. The hypoxic regions were then visualised by immunohistochemical staining of pimonidazole (brown). Nuclei were counterstained with hematoxylin. 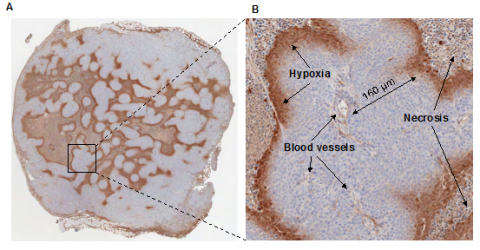 (B) An enlarged tumour region from (A) showing a hypoxic area and blood vessels (~ 70-200 μm). Necrotic regions were also identified beyond the hypoxic regions. 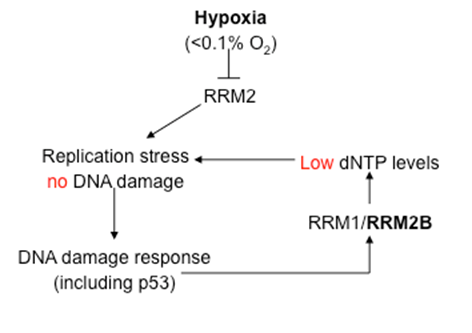 We are investigating the biological response to hypoxia and in particular a pathway known as the DNA damage response. This pathway is active in hypoxic conditions despite a lack of detectable hypoxia-induced DNA damage. There are many drugs to target this pathway and it is possible that they will prove particularly useful in killing hypoxic cells when combined with standard therapies such as radiation. We are developing novel drugs which only work in the absence of oxygen and so can be used to target the hypoxic areas of tumours. This approach allows us to use potentially toxic drugs as the normal cells in the body are unaffected. Finally, it is vital that novel inhibitors/drugs are tested in conditions which mimic those found in tumours. Therefore, we test drugs in conditions which more closely resemble those found in tumours, including low oxygen, to determine if they are likely to be effective. Preclinical testing of an Atr inhibitor demonstrates improved response to standard therapies for esophageal cancer. Design, synthesis and evaluation of molecularly targeted hypoxia-activated prodrugs. Hypoxia-induced p53 modulates both apoptosis and radiosensitivity via AKT. CH-01 is a hypoxia-activated prodrug that sensitizes cells to hypoxia/reoxygenation through inhibition of Chk1 and Aurora A.